What Are The Symptoms Of AFIB (Atrial Fibrillation)? Are Vegetarian Protein Sources Enough For An Athlete? How to Cure Canker Sores Naturally and Quickly? What Can You Eat on a Keto Diet to Lose Weight? What Are the Benefits of Tuna to Your Diet? Fluid Retention Signs And Natural Solutions – 4 Homemade Remedies! How to Clean Stainless Steel Refrigerator Ecologically? Reduce Sun Spots on Skin Using Natural Remedies! How to Get Rid of Cellulite on Legs Using Homemade Remedies? 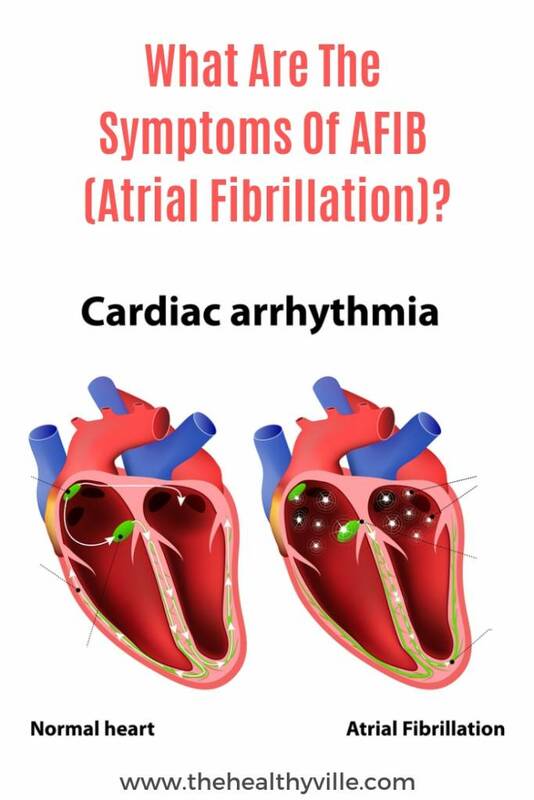 Home Health What Are The Symptoms Of AFIB (Atrial Fibrillation)? What are the symptoms of AFIB? Atrial fibrillation is one of the most frequent types of arrhythmia. Given its high prevalence, it is important to know how to diagnose it. Doctor diagnose atrial fibrillation mainly by electrocardiogram, since there are many types of known arrhythmias. An adequate and early diagnosis will allow to better cope with the disease, making changes in the habits of life and food, as well as establishing a treatment as soon as possible. If you want to know what are the symptoms of AFIB, its possible causes and diagnostic methods we tell you in the following article. What are the symptoms of AFIB atrial fibrillation? Arrhythmias are changes in the conduction and contractility of the heart that affect the transport of blood. Atrial fibrillation can lead to a higher risk of stroke. In some cases, it can also cause chest pain, heart attack or heart failure. What happens is that the atria (the upper cavities of the heart) contract irregularly and uncoordinated with the ventricles (the lower cavities of this organ). Now that you know what are the symptoms of AFIB, you should look into the types of AFIB and how to diagnose them. Chronic. In this case, the patient maintains fibrillation over time and needs therapy to calm the symptoms. Paroxysm. The alteration appears by chance and the associated symptoms resolve themselves. In any case, this disorder can have serious consequences. Among the most common risks include cerebral infarction and arrhythmia or cardiac rhythm disturbance. What are the possible causes of atrial fibrillation? Atrial fibrillation can appear for multiple causes. Pericarditis or inflammation of the pericardium (thin layer that envelops and protects this organ). Damages suffered during a surgical intervention of this organ. Pathologies of the respiratory system such as COPD. How is the diagnosis of atrial fibrillation carried out? Stethoscope on electrocardiogram to diagnose atrial fibrillation. The diagnosis of atrial fibrillation allows us to rule out other possible arrhythmias, as well as possible causes. In this test, on the chest and arms of the patient doctors place electrodes. These devices are designed to capture the electrical signals that control the movements of the heart. Next, a graphic representation of these nerve impulses is obtained. Holter monitor. It is a portable ECG that the patient records heart activity for 24 or more hours. Episode recorder. In this case, the patient activates the device when he / she suffers from tachycardia symptoms. Thus, a study of the moment of the alteration is obtained in a simple way. Unlike the Holter Monitor, the study can be done in a period of several weeks or even months. Further info: Stop A Tachycardia Attack Naturally And In A Matter Of Minutes Using This! Specialists project a set of sound waves through a device (called a transducer) to the patient’s chest. The waves reach the heart and bounce off the thoracic cavity. Later, a live image of the patient’s heart forms after the computer processing. This procedure is called a transthoracic echocardiogram. However, the transducer attached to a flexible tube can also be introduced through the patient’s mouth. Once it reaches the esophagus, the test is performed and more precise details are obtained. In this way, specialists can check the structure of this organ and the presence of clots in it, being a conclusive test for the diagnosis of atrial fibrillation. The Holter or ambulatory electrocardiography is based on an electrocardiogram that records the functioning of the heart for 24 or 48 hours, while performing usual activities. This allows detecting episodes of AFIB of short duration. Obtaining internal images. As a general rule, a chest x-ray is useful to check the condition of the lungs and heart. Exercise or exercise test. In it the patient performs a brief physical activity while the team of specialists reviews the cardiac response. Routine tests. A blood test can rule out an underlying disease. For example, it is the case of hyperthyroidism (elevation of the levels of thyroid hormones in the blood). Also, other tests can help in the discovering if the patient has a respiratory disorder (usually, COPD). Don’t forget to SHARE what are the symptoms of AFIB with your friends and family on your social networks!